INCLUDES LUNCH and Personal Interaction with other Reno Women regarding the use of a firearm! 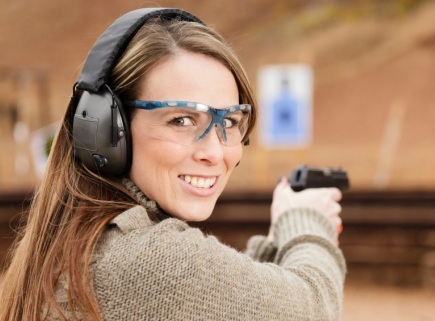 Ladies: This is about learning how to use your gun; you WILL know how to use it efficiently, effectively, and will know more than HIM on how to use your firearm in a safe and effective manner! Is he scared? You bet he is! You will also know how to use your husband, boyfriend, or other significant other's gun; it's NOT a mystery. This class will teach you EVERYTHING you need to know about operating a PISTOL and/or a SEMI-AUTOMATIC with confidence. Exceeds All Reno Nevada state and local requirements - accepted in ALL counties! Designed for ladies to learn in a comfortable, safe, small group environment. t’s Ladies Day for Reno Nevada! Leave the guy’s and kids at home! This is an introductory firearms safety and training course in a casual small group environment; not a marksmanship class or tactical course. Taught by a Female Certified Firearms Instructor. In-depth safety principles are stressed including rules for safe gun handling, pistol parts, operations, ammunition, range rules, shooting from various positions. Great for first time gun owners. This class is more fun when taken with friends! Students provide 50+ rounds of ammunition and eye/ear protection. Minimum .22mm caliber pistol; firearm rentals are available upon request.